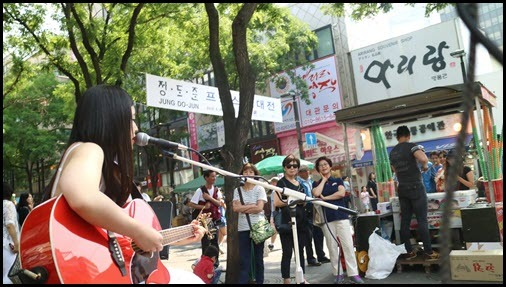 Busking at Insadong by Nakwon Music Mall – Peter's Site! 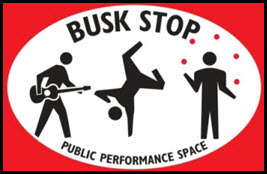 I have always enjoyed watching buskers perform, and I have been fortunate enough over the years to have seen some amazing musicians, magicians, and performers – plus a few real weirdos of course – just by walking down the right (or wrong) street at the right (or wrong) time. Even when their performances weren’t exactly in line with my musical tastes, I respected the fact that they had the courage to share with complete and sometimes totally disinterested strangers the things they love doing. 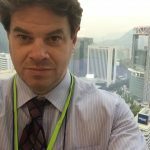 Regardless of the presence or absence of skills and talents, I was always envious of them and often imagined myself standing in their place, drawing a generous and huge crowd. 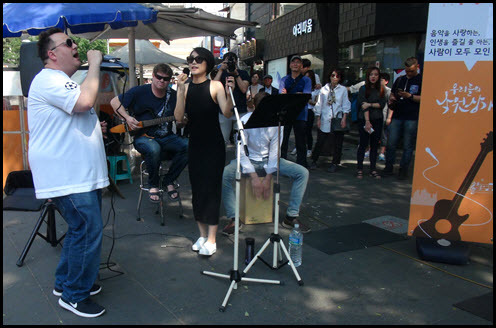 Despite that dream, I had never busked until the supportive and professional staff behind the Nakwon Supporters Program invited myself and my fellow 2Much band mates to do exactly that on Seoul’s historic and famous Insadong Street right by Nakwon Music Mall. Saturday, May 28 was the big day. Fellow Nakwon Supporter Mimi Roh started the afternoon’s entertainment with her big red guitar and three songs: “Blank Space” by Taylor Swift and two of her own compositions: “Sparklin’ Bright” and “Ponder The Sky”. I really admire her for writing and performing her own songs. Even if I could write my own songs, performing them would be much, much scarier than performing well-known and much-loved hits. 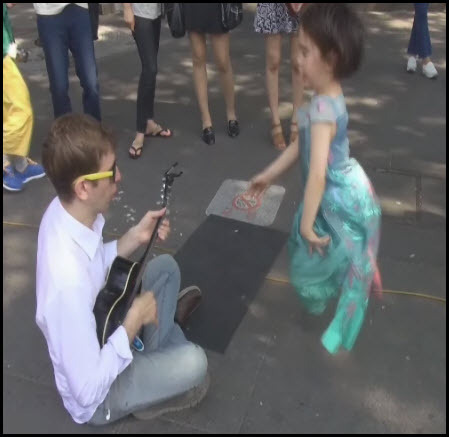 There’s nothing hard about that at all once you learn the song, but performing your own song is, especially while busking, akin to sharing a part of your soul with a bunch of strangers. That takes more courage than I possess. Ian Burgos, Liyuan “Maggie” Huang, Jake Botello, and I (Malcolm McLaughlin was busy that day – see below) then took center stage for our own three-song set. “Every Breath You Take” by The Police was our first song. It’s a personal favorite of mine because of its distinctive and very cool-sounding arpeggios. Plus, it’s simply a great song. I’ve seen Sting twice in concert and both times “Every Breath You Take” was the highlight. Performing it is made all the more enjoyable by the combination of Ian and Maggie’s sweet voices. Our second song was “Happy” by Pharrell Williams, and what a perfectly named song it is. It’s not only a whole lot of fun to play, it never fails to get a huge response from our audience, and that more than doubles the fun. 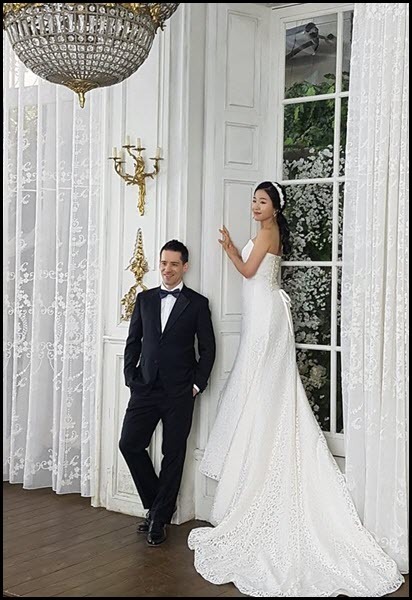 Malcolm and Yun-seon’s wedding next month offers another musical first: the happy couple wisely invited 2Much to perform a few songs on their most special of days. Performing at their wedding is sure to be another highlight on this unique and fun musical journey we’re all lucky enough to be on. No jeans and T-shirts for that gig, and that’ll be another first. Tagged2016GuitarNakwon SupportersPeter's BandPeter's Music Videos! Next Article June 2016 Fitness Diary!